A bicyclist suffered a serious head injury when he was hit by a car near American Boulevard in Brentwood Tuesday evening, Suffolk County police said. Carcamo Monge, 21, of Brentwood, was riding his bike north of American Boulevard when he was apparently hit by a car driven by Brian Guinta, 21, of Islip, police said. Guinta was driving north on Commack Road at 6:27 p.m. when the accident happened, police said. 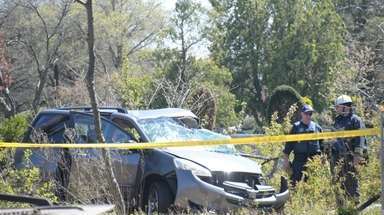 Monge was taken to Southside Hospital in Bay Shore with a "severe head injury," police said. Guinta, who was driving a 2006 Dodge, was not injured. Police impounded Guinta's car for a safety check and ask anyone with information on the incident to call the Third Squad, 631-854-8352.